This heavenly authentic Finca is located in a charming area of unique nature with stunning views over the Mediterranean hills near Sant Miguel. The rooms are decorated tastefully, arty and with loving attention to detail and will spoil even the most far traveled guest with their high standards and relaxed luxury. You will relax on the 40.000m² property in the midst of a breathtaking scenery and the distant sea view. The large pool is framed by palm trees, mimosas, oleander and a teak terrace with wooden sun beds and parasols. It is a great chill out and BBQ area made perfect by the outdoor bathroom and the additional outdoor shower. 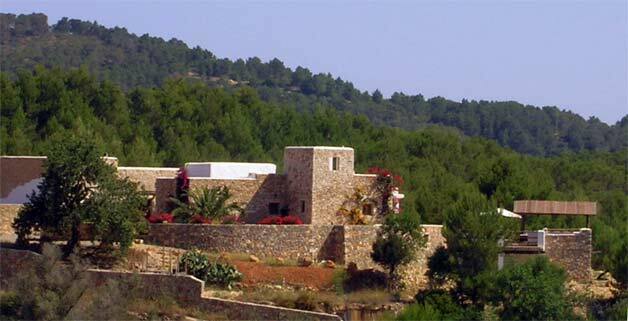 The Finca has about 190m² on two floors. You enter the Finca through a grand wooden portal which leads you into the salon with the satellite TV. From here you enter a large comfortable kitchen with generous dining area, dishwasher, microwave, American fridge, electric oven, ceramic stove and a beautiful fire place. One master bedroom with en suite bathroom , a second double bedroom and a second separate bathroom, both bathrooms are fitted with showers, Jacuzzi and bidet. There is a séparé off the kitchen which can be used as a sleeping area for two children under 10 Years. On the second floor is third bedroom with two single bed which can be arranged as a double. The salon an the master bedroom have aircondition. There is plenty of fitted wardrobe space for all guests! The whole Finca was only finished in 2004 there for all technical and sanitary appliances the latest standard. There is an adjoining laundry room with washing machine and dryer which is accessed from the outside. A separate 60m² apartment ( built in 2006) is located beside the pool area, containing one double bedroom with en suite bathroom and lounge area. Perfect for guests or nannies.